As I began to work on this article explaining why Eve is blamed for the original fall into sin, it occurred to me that many of the factors influencing theological change are just new versions of the same snare. As you read, think of the parallels we face today. So why is the woman blamed for the fall? Up until around 200 or 300 B. C. she was not. It was during the time between the Old and New Testaments that the change came. After the prophet Malachi spoke in about 430 B.C., the voice of God was not heard again until John the Baptist prepared the way for Jesus. During that time of silence numerous factors had strong effects on the culture and thinking of the Jewish people. Two primary and overlapping influences were the Babylonian exile and the rising prominence of Greek thought and culture. 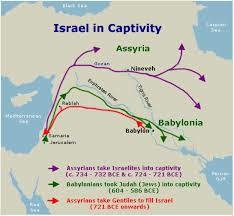 In contrast the Southern Kingdom, Judah, fell to the Babylonians who allowed exiles to settle together, and keep their religion and customs. However, the surrounding culture was still an influence. Seventy years later a remnant returned to the Promised Land to rebuild the temple and repopulate their land. More Jews remained than returned and the continuing influence of those left behind is clearly seen in the Babylonian Talmud. The Talmud is a written record of the teaching of the rabbis on the Old Testament Law of Moses known as the Torah. The Babylonian prejudice against women negatively impacted the lives of Jewish women. The thoughts of Socrates, who died in 399, followed Plato (428-347) and Aristotle (384-322) and, along with the military conquests of Alexander the Great (356-323), enhanced the strong Greek influence on the Jewish culture. We still speak of the ancient Greeks with great admiration. In order to bring Jewish beliefs into line with prevailing Greek thought additions and changes were made to interpretation of scripture. One blatant example of the change in rabbinical teaching was placing the blame for the fall on the woman, making the story line equate with that of the Greek myth of Pandora, who opened the forbidden box and let evil escape into the world. The continuing influence of Greek as well as Babylonian culture can be seen in the following quotes from the Talmud, well known at the time of Jesus. The most ancient existing reference to Eve as the source of evil is to be found in a book which is known as Ecclesiasticus, or The Wisdom of Ben Sira, originally written in Hebrew, probably about 250 B. C., but quickly translated into Greek in Egypt. It contains these words: “From woman a beginning of sin; and because of her all die” (Ecc. 25:24) This is a contradiction of what we read in Genesis, Job and Romans. Around 300 BC, seventy Jewish scholars translated the Torah into Greek in Alexandria, Egypt. Translation of the rest of the Old Testament followed. This valuable work is known as the Septuagint. Unfortunately, beginning about 258 BC, Jewish uninspired writings, called The Apocrypha, written in Greek, not Hebrew, were incorporated into the Septuagint. Many of the church fathers quoted the Apocrypha as authoritative, and all were influenced by its teachings. Thus it easily happens that the character of the mythological Pandora, seen in Wisdom of Ben Sira also called Ecclesiasticus, is ascribed to Eve. The scripture does not confirm the truth in any of these sources, but their words have influenced teachers and customs through the years. Woman fell victim to ancient forms of political correctness. Christians today face different issues but the same snare. God’s people are pressured to put aside His Word and accept the dictates of modern culture. Will we be deceived as Eve, disobey as Adam or will we trust God and stand? Menahot is a book from the Talmud, Rabbi Meir taught this quote. These Jewish blessings have parallels in a variety of classical Hellenistic sources and are attributed to Socrates and Plutarch, as well as other notable figures.